Even when I am on vacation, I can always find time to stitch. My husband, Paul, and I are taking a much needed vacation in Cape Breton, Nova Scotia. Visiting Cape Breton, especially the Cabot Trail, should be on everyone’s Bucket List. The scenery is nothing short of breathtaking! Of course, I take my applique with me everywhere I go! Whenever I travel, “being packed” means having my prepped block, my thread, my scissors, and my thimble….oh and some clean clothes! Before we left for holidays, we finally hung my quilt, Reminiscence, a pattern by Lydia Quigley, in the front entrance. Notice how some of the nine-patches in the sashing are a darker blue? Most people think that was done on purpose! But here is what really happened…but remember…mum’s the word! I carefully cut, stitched and counted the many, many, nine-patch units. When it came time to put the quilt together, I was short 15 nine-patch units. Of course, the fabric was discontinued and I could not get any more. I decided to make the missing nine-patches out of navy blue fabric and then place them strategically in the sashing. I am sure one day I will find a baggie full of the missing nine-patches! Here is a close up. The machine quilting was expertly done by Rose at Elite Quilting. Rose brings all my quilts to life!! And here is the label. It’s not finished until it has a label on it!! Lately, I have been on a mission! My mission is to have a label on the back of every quilt. I believe it is so important for future generations to know the history of the quilts that will likely be passed down to them. Here are a few quilts and the labels that go with them. All of the quilts shown were machine quilted by Elite Quilting. I made this quilt for my daughter, Kelly. The pattern is a Piecemaker’s Calendar from 1999. The quilt is hand-appliqued in blocks, then stitched together. The little girl raking the leaves always reminded me of Kelly, so I made that block twice and included one on the back. Here is my version of “Aunt Millie’s Garden”. Every year my Sunday Afternoon Applique Group chooses a quilt pattern and everyone works on their own quilt. This is the quilt we worked on last year. It belongs to my daughter, Courtney. When I told her I was going to give it to her, her only response was: “Gee….it’s bright”! I was rather speechless when I saw the amazing job that Rose (from Elite Quilting) did!! The group is getting together this Sunday. Won’t they be surprised when they see it actually has the binding AND a label on!! This is “A Mermaid’s Garden”, which is based on the pattern, Simple Gifts, by Mary Sorenson. 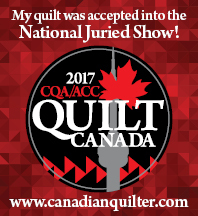 We entered this quilt in the MQX show a couple of years ago, and Rose won a ribbon for the machine quilting. Here is a close-up of the quilting Rose did. What information do you put on a label? Include anything that is important to you! If I make a quilt specifically for someone, I make sure the label states that. Not that I think my family will be fighting over my quilts (!) but this just clears up any misunderstandings! !